Home › Pro Wrestling › Dear Undertaker, Thank You. When one discovers their passion for a certain genre, they eventually find that one individual or character that they admire and sometimes even live through vicariously. For me, that passion is fake fighting and the character is a dead wizard with supernatural powers. I’ll never forget the Undertaker’s first appearance, which occurred at the 1990 Survivor Series in Hartford, CT. It would be the final time the event was held on Thanksgiving night as the demise of a tradition brought about the genesis of an indelible legacy. This imposing figure was the mystery partner of Ted DiBiase’s Million Dollar Team. As a kid who cheered every good guy and booed every bad guy, I was impressed. 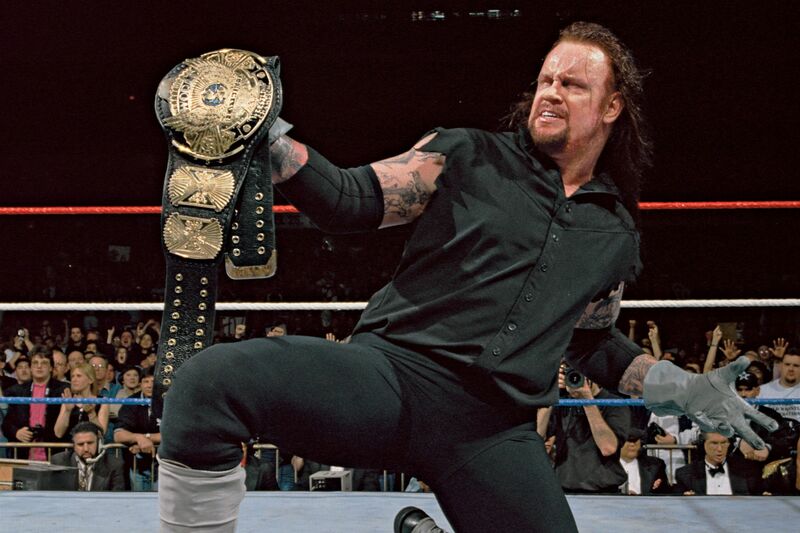 A year later, Undertaker won his first WWE Title from Hulk Hogan. I didn’t bat an eye when this evildoer who represented death stole the championship from an American hero. Two months later, Undertaker prevented Jake Roberts from blindsiding Randy Savage and Miss Elizabeth with a steel chair. OMG, was the Undertaker now a good guy? No, No, No. It was a simple misunderstanding…right? “Not yours”: two words that changed my wrestling fandom forever. Two words that turned the villain of the story into the hero of the day. Two words that spurned Jake Roberts’ demand when he asked the Undertaker whose side he was on. I couldn’t believe it. The Undertaker was officially a good guy. There are very few characters in pop culture that have meant more to me than the Undertaker. Growing up, I wasn’t the tallest tree in the woods or fastest car on the track, and fitting in with my complexion was the struggle of the norm. Standing my ground wasn’t always easy, wishing I could simply scare my problems away. Undertaker was the ultimate conqueror who didn’t just vanquish his opponents, he frightened them with grave intentions. Giant Gonzales, King Kong Bundy, Kama, Berzerker, Yokozuna, were all rogues who took their nefarious deeds too far and eventually found themselves across the ring from the deadman. I cheered with utter glee when he scared Kamala out of Wembley Stadium on my birthday, I wept when twelve wrestlers cost him the WWF title by putting him in a casket, I looked on as a concerned friend when Mankind seemingly had his number, and I partied like a rock star when he dethroned Psycho Sid to begin his first real run as WWF Champion. When the Attitude Era was all about Austin 3:16, I was rooting for the Undertaker to win at Summer Slam 1998. Even when the internet loathed him in 2003 for his uninspired performances, lack of selling for his opponents and refusing to put people over, I chalked it up to veteran prerogative. To me, the Undertaker represented the last line of defense against the forces of evil. Sure, heels looking for their comeuppance either get their attitude adjusted or a spear for their troubles. However, there was something absolute and final about the Undertaker finishing off an opponent. Bravado went by the wayside while trapped in the clutches of a Tombstone piledriver. On April 2, 2017, a Sunday night, The Undertaker wrestled his final match when he lost to Roman Reigns in the main event of WrestleMania 33. 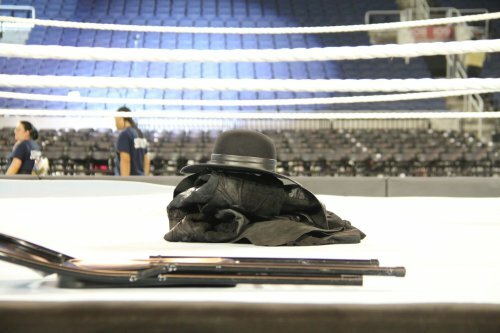 Afterward, he took off his gloves, his trench coat, and his hat and placed them in the middle of the ring, symbolizing his retirement. It’s fitting that the Undertaker’s last ride went past the midnight hour as the end of an era ushered in the dawn of a new day. When it’s time for the Undertaker to take his rightful place in the Hall of Fame, I hope it’s Mark Calaway giving the speech. It would be nice to hear from the man instead of the myth, reminiscing about his career, road stories and days gone by. It’s something that’s never happened at length since he’s such a worker and rarely breaks character. The question now is what will wrestling look like without the Undertaker. The show will go on, of course, but that once in a lifetime attraction that gave me goosebumps is gone. That is one void that will never be filled. I’m sure fans will chant “One more match” the next time Undertaker appears in front of a capacity crowd. Temptation is a helluva of a drug, however, Mr. Calaway, please, don’t give in. You have given more than most pro wrestlers ever have and ever will. Enjoy your family and take the time to do you. Thank you for helping a shy kid get through some tough times. Thank you for the plethora of legendary nights. Most of all, thank you for being the Undertaker.